The deepening global economic crisis, accelerating climate change and pressures of large-scale urbanisation have rekindled interest in the notion of sustainable urban development. The capacity of cities to absorb the majority of the world’s population growth while providing adequate livelihoods and essential public services will be crucial in the years ahead. Disorderly urbanisation will cause social unrest and expose people to dangerous living conditions and environmental hazards through unregulated building on unsuitable land. Simplified indicators gleaned from readily available data sources can assist decision makers to monitor a dynamic situation and implement policies to help cities become more resilient. 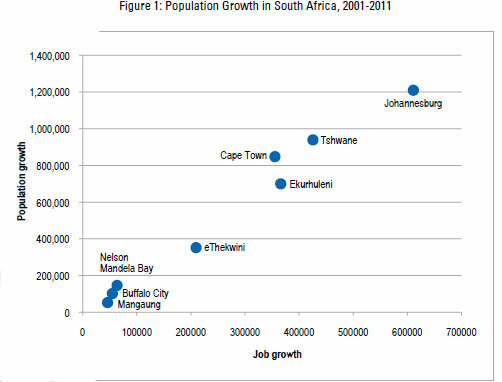 We used Census data from Statistics South Africa to develop suitable indicators for the eight largest cities in the country. We wanted to know whether the pattern of urban development was contributing to socioeconomic progress and would be sustainable in the longer term. The significance of urbanisation in South Africa is apparent from the fact that nearly two-thirds (63%) of total population growth between 2001 and 2011 occurred in just eight cities. Their average annual growth rate was three times higher than in the rest of the country – a striking disparity. 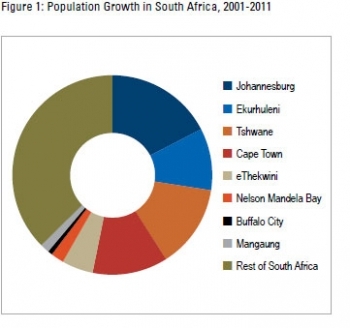 Over half of all population growth occurred in the three Gauteng metro’s (Johannesburg, Tshwane, Ekurhuleni) and Cape Town (Figure 1). This uneven distribution translates into very different challenges and opportunities across the country, placing exceptional strain on the major metro’s to accelerate basic service provision and jobs in order to keep pace with rising demand. Rapid demographic growth requires many new schools, clinics, roads, water pipes, sewage treatment plants, electricity networks and waste disposal facilities. This all adds to the pressure on local ecosystems and natural resources, such as water courses, air quality and biodiversity. Government systems of resource allocation do not appear to give sufficient recognition to these variations in population growth, adding to community dissatisfaction and protest in expanding urban settlements. Migration is not a classic sustainability indicator, but depending on its scale and composition, it can destabilise community cohesion and reduce a city’s resilience. Rapid rural and international migration complicates orderly urban development and therefore needs to be monitored and actively planned for. However, urbanisation is most certainly bound to continue. The 2011 Census showed that migrants now constitute more than double the share of the population in the metro’s than in the rest of the country. More than one in three residents in Gauteng moved there from elsewhere. There were substantial improvements in the availability of basic services throughout South Africa between 2001 and 2011. The metro’s generally managed to keep pace with the needs of a growing population, as well as making inroads into their historic backlogs. Hence real progress was achieved in access to internal piped water, flush toilets within the vicinity, regular refuse removal, and levels of educational attainment. Towns and rural areas outperformed the metro’s in one respect – access to electricity. There was less success in reducing the number of people living in informal dwellings (shacks). Government efforts to build RDP houses in the biggest metro’s could not match the demand, resulting in nearly one in five households now living in shacks. The biggest increase was in Cape Town, where the number grew by more than 75 000 (an increase of 53%). The number of households living in shacks in Johannesburg increased by 37 500 (17%). Even more interesting was the growth in the number of households living in backyard shacks. This is a relatively new social phenomenon whose significance has not been grasped by national or local policy makers or urban researchers. In almost every city there was an increase in backyard shacks (Table 1). This was offset in most places by fewer households living in free-standing shacks in informal settlements. Johannesburg experienced the biggest increase in backyard shacks, followed by Cape Town and then Ekurhuleni and Tshwane. Cape Town was unusual in experiencing an increase in both backyard and free-standing shacks. Backyard shacks have been far less important outside the big cities, which may be the reason why they’re off the radar screens of politicians and the media. Backyard shacks serve a positive function in helping to densify existing townships and RDP settlements. Services such as public transport, electricity, water, sanitation and refuse removal can be delivered more efficiently to concentrated communities. This helps to keep down the costs to users and ratepayers. Another important advantage is the rent paid to poor households (the “landlords”). Renting backyard space also affords the tenants considerable flexibility. They can move on when their circumstances change, without tying up their assets in property. Many established townships are located closer to work opportunities than informal settlements, so backyarders have more chance of finding a job. These advantages need to be set against several negatives. The capacity of basic services is already overloaded in many townships. Unplanned population growth can push infrastructure networks and distribution systems beyond the tipping point, causing them to collapse. The quality of service delivery is most likely to suffer from more frequent breakdowns and blockages. Furthermore, overcrowded properties can pose health risks and lead to outbreaks of infectious diseases, especially if the tenants cannot access the services in the main dwelling. Excessive densities of people living in confined spaces and under squalid conditions also contribute to social tension and increased frustration. Employment in the metro’s grew more strongly than in the rest of the country between 2001 and 2011. This accounts for approximately 60% of all job growth. The largest absolute gains were in the Gauteng metro’s and Cape Town, with just under half of all job growth in the country. This demonstrates the unique role of cities in providing sustainable livelihoods. The scatterplot (Figure 2) shows that employment growth broadly kept pace with population growth in the metro’s. The 2011 Census is least effective in reflecting environmental indicators. A big achievement was the reduction in the proportion of households using solid fuels in the cities. There are positive environmental effects (less air pollution) and major health benefits from the fact that very few households in the metro’s still cook with solid fuels. The take-up of solar energy is still low throughout the country. Adequate and affordable energy services are integral to sustainable economic and social development. South Africa relies very heavily on coal to generate electricity, leading to substantial greenhouse gas emissions, pollution and health problems for people living near power stations. Greater use of renewable energy sources is therefore an important indicator for the metro’s. Deputy Executive Director, Department of Economic Performance and Development, HSRC.